Syrian rebels have been fighting Bashar al-Assad’s forces for nearly a year and a half in a conflict that has caused 20,000 deaths. As the world watches in horror, much confusion remains about the nature of the rebel troops, the identity of the regime’s supporters, and what actions — if any — should be taken by the rest of the world. The Syrian rebels represent a range of interests. Most are Sunni Muslims that have been shut out of power by the current Shia Alawite regime. Among others, they include Muslim Brotherhood members and — more recently — a mix of al-Qaeda supporters. The Syrian regime is supported by middle-class and wealthy Syrians, Alawites, and Christians, who together constitute nearly half of the population. Syria has become a battleground for disparate forces with vastly differing goals. It is likely that the Syrian regime will be toppled soon, but no one really knows what will happen afterwards. The best guess is that the killings will continue as these groups continue to fight for power. Although these internal forces are deadly, even graver complications have arisen as a result of external meddling. A host of self-serving sharks have exploited the legitimate struggle against the dictatorial Assad regime to serve their own regional interests. This outside interference has only worsened the catastrophe for the Syrian people. While the United States and its allies were quick to declare that Assad must go, they have largely turned a blind eye as the rebels have committed extreme atrocities against regime forces and their supporters. They have overlooked the concerns of Syria’s minorities, who have enjoyed the protection of the regime and perceive the conflict as a fight for their lives. The United States and its allies are providing covert support to the rebels through ground operations at the Turkish border with Syria. Turkey’s primary interest is to ensure that the Kurds living in Syria and Iraq do not foment more discontent among the 14 millions Kurds in Turkey. For its part, the United States is seeking to ensure a pro-Western regime in Syria that will be friendly to U.S. interests and its allies in the region. Saudi Arabia and the Gulf states are supporting the Sunni Syrian rebels with tens of millions of dollars for weapons gladly funneled by intermediaries of the Western powers such as Turkey. These conservative Sunni regimes are fomenting a sectarian war against the Shia. The simplistic narrative of brave Syrian rebels fighting for their freedom against a cruel and vicious Syrian regime obscures the more complex story of sectarian strife, which has been stoked by internal and external forces alike. In public there is little to no discussion about the role our allies have played in fueling a sectarian war in the Middle East. Instead, the sectarian bloodbaths occurring all over Syria are portrayed almost exclusively as regime atrocities, leading to more Western calls for regime change. Our Iraq policy created sectarian divisions resulting in the deaths of tens of thousands of people. Continuing our false posturing in Syria only underscores regional impressions of U.S. foreign policy as deadly and devious, and reminds the inhabitants of the region that we are not to be trusted. Yet the United States and its allies are also acting in response to the meddling of others hoping to benefit from propping up the regime. The Iranians are supporting Assad to help maintain their foothold near Israel and to increase Iranian influence in the Middle East. The Lebanese — who remember all too well their own 15-year civil war — are caught in the middle, trying to avoid a spillover of the sectarian violence into their country. Russia has its lone warm-water naval base on Syria’s Mediterranean coast and would like to maintain it. Still fuming about how the West’s no-fly zone in Libya morphed into full-fledged campaign for regime change, the Russians have vetoed any UN resolution that could be interpreted by the West as authorizing a military intervention in Syria. China would also like to weaken the West’s hold on the Middle East. Next door, the Israelis are working to secure Syria’s stockpiles of chemical weapons. These actions are stirring the pot in a bubbling Middle East. Although many observers have expressed concern about the security of Syria’s chemical weapons, many others suspect that Israel — the region’s only nuclear power — is primarily concerned with maintaining its own qualitative military advantages. Israel has not signed the nuclear non-proliferation treaty (NPT) and the chemical weapons ban, but the Israelis are apparently keen on non-proliferation outside their borders. Syria has a delicately balanced complex multi-ethnic society that cannot afford a sudden change, and the country is on the road to a prolonged bloody civil war that could engulf the region. 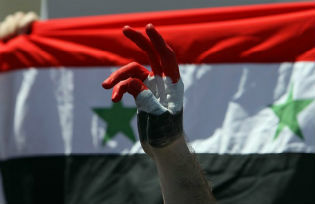 The Assad regime will be part of the civil war whether Assad leads it or not. The West and its allies have apparently tried to avoid exacerbating the bloodshed, but the pressures inside and outside of Syria are precipitating our descent into unconscionable interference. There is still time for the West and the rebels to avoid falling into the same abyss as Assad. The United Nations should pass a resolution to stop or curtail weapons shipments for sectarian groups of any stripe and refer all atrocities from any side to the International Court of Justice. Moreover, the UN should call for a conference of all sides in Syria. At this stage of the conflict, the goal should be to stop the killing and find a peaceful resolution. The world community has to act quickly to stem the tide of Syria’s civil war. Bleeding Syria to death so outside powers can enjoy the carcass is a dangerous game that no one will win. Adil E. Shamoo is an associate fellow of the Institute for Policy Studies, a senior analyst for Foreign Policy in Focus, and the author of Equal Worth – When Humanity Will Have Peace. He can be reached at ashamoo@som.umaryland.edu.